We supply willow for basket making, hurdle making, living structures, wreath making, sculptures and crafts. Our willow has gone to artists, festivals, crafts people and a whole load of others. We grow around 30 different willows and each has its own particular characteristics. Light Dicks, Dicky Meadows, Green Dicks, Norbury, Brittany Greens, Whissender, Noire de Villaine, Flanders Red. For large structures, sculptures and hurdles we grow a number of Salix viminalis varieties. 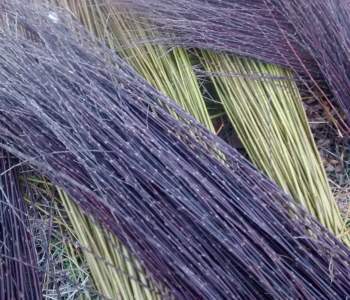 Decorative willow varieties include a contorted willow Caradoc as well as red, yellow and purple willows. For advice on which willow would be suitable for your project, to make an order and arrange a visit please contact us. If you are considering purchasing willow you would be very welcome to come and see it first, so that you can see the quality of the product and select exactly what you want. Please contact us in advance to arrange a visit. We have found that each variety grows slightly differently from year to year in terms of height and vigour – influenced by pests, diseases and weather. We don’t use chemicals on the willow so the crop is variable from season to season. We sell “green willow” when it is freshly cut and still flexible – between January and May, or as “brown willow” once it has dried. Brown willow will need to be soaked before it can be worked. If you need advice on soaking, please ask; we are happy to pass on any information we can. We don’t have a standard size bundle. 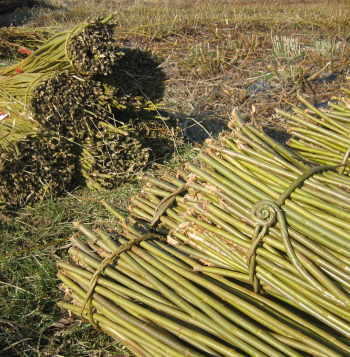 When we cut the willow between December and February we sort and grade each variety into length on site. As a full bolt*can be very heavy, we tend to divide willow into manageable bundles. We then measure the circumference of a bundle and calculate what proportion of a full bolt it is and charge accordingly. For most varieties pro rata price per bolt is £40 (premium varieties £50). Some larger stems and decorative willows are priced individually. *A traditional bolt is 37” circumference measured 2” above the base. We make a range of willow products for the garden – see here. If you are looking for sticks, you might be interested in our hazel grown on the farm as well as willow. Click here to find out more.